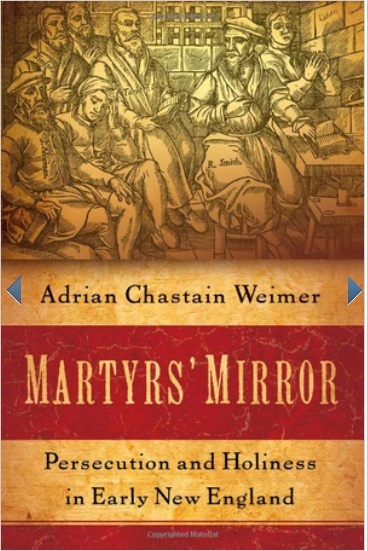 Last month , Adrian Chastain Weimer, assistant professor of history at Providence College, published Martyrs’ Mirror: Persecution and Holiness in Early New England (Oxford). The book studies seventeenth-century colonial conceptions of martyrdom and religious persecution and the ways in which these conceptions unexpectedly shaped American civil rights landscape, especially in the areas of religious liberty and tolerance. Complicating the picture, however, Professor Weimer adds the fact of religious persecution by Puritans in the colonies. New England Congregationalists, Separatists, Quakers, Baptists, and Antinomians all suffered for their beliefs in England and also conceived of themselves as martyrs, a perception that only deepened when the Puritans, in turn, targeted them in the New World. This passing on of persecution from Puritans to other dissenting religionists created a form of competition amongst early Americans to cast themselves in the narrative role of the persecuted martyr. Weimer argues that, through this narratological competition, these ugly conflicts gave rise to paradoxical notions of religious tolerance. The coveted narrative of persecuted martyr, which suggested divine favor, actually led to colonists’ looking askance at persecution. Ultimately, what these diverse groups shared were memories of persecution. And eventually, these memories and the competition for the role of martyr gave rise to legally enshrined rights of religious freedom that have developed until today. Please see Oxford University Press’s description of the text after the jump. Martyrs’ Mirror examines the folklore of martyrdom among seventeenth-century New England Protestants, exploring how they imagined themselves within biblical and historical narratives of persecution. Memories of martyrdom, especially stories of the Protestants killed during the reign of Queen Mary in the mid-sixteenth century, were central to a model of holiness and political legitimacy. The colonists of early New England drew on this historical imagination in order to strengthen their authority in matters of religion during times of distress. By examining how the notions of persecution and martyrdom move in and out of the writing of the period, Adrian Chastain Weimer finds that the idea of the true church as a persecuted church infused colonial identity. Though contested, the martyrs formed a shared heritage, and fear of being labeled a persecutor, or even admiration for a cheerful sufferer, could serve to inspire religious tolerance. The sense of being persecuted also allowed colonists to avoid responsibility for aggression against Algonquian tribes. Surprisingly, those wishing to defend maltreated Christian Algonquians wrote their history as a continuation of the persecutions of the true church. This examination of the historical imagination of martyrdom contributes to our understanding of the meaning of suffering and holiness in English Protestant culture, of the significance of religious models to debates over political legitimacy, and of the cultural history of persecution and tolerance. Reveals that early Protestants venerated martyrs, or saw themselves as a persecuted people. The publisher’s and Amazon page also display critical blurbs of Weimer’s text that elucidate its contents and value as a scholastic contribution.